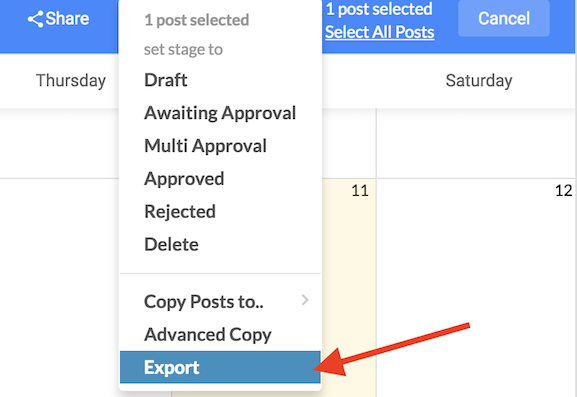 You can export your content to a spreadsheet from either the Month or Day view - up to 500 posts at a time! In either view, choose “Select Posts” in the top right navigation bar, and select the content you want to export. In the Month View, select content by clicking on each post. In the Day View, select content by clicking the checkbox next to the post. *Pro-tip! Exporting content for an entire month? Use the “Select All” button. *If the spreadsheet doesn’t download, check for a pop-blocker, often seen in the right-hand corner of your URL bar.